Ahem, yes, I've been MIA in blogland for...2 years! Just yesterday I sent out my monthly Stampin' Up! newsletter and had a link for my "Sad and neglected blog", but there are still some good ideas on the few blog posts that I do have here. (insert crying laughing emoji). I recently cleaned my craft room for one our Kaleidoscope Team challenges and whenever I clean my room, I always get the urge to create which leads to mess. It's a never ending cycle really. The good news is that I've been creating and finding JOY in the creating. That's what's important. Especially when I've been held hostage making memories with 4 children for 3 months! I call it the Cosmic Frappe! Remember when Starbucks was doing all those goofy and ridiculously high calorie fancy frappes? This is my version. I used the Shaving Cream technique (which now I incidentally smell like a freshly shaven man) and swirled Real Red and Elegant Eggplant Stampin' Up! reinkers around in it. Then smoosh a piece of Whisper White card stock and wipe off the excess. I used the coordinating framelits to cut out the shape of the cup. Also fun, I made a mask using a window sheet and the new Embossing Paste and made that somewhat fluffy looking whipped cream to go on top! I also cut out a window sheet to make the plastic dome on top of the frappe. I know Starbucks uses more of a Garden Green coloured straw, but Lemon Lime Twist was the green (or yellow?) of the challenge. A few other fun accents are the wave-like framelit from Swirly Scribbles and the Star Textured Impressions Embossing Folder. And don't forget the clear Wink of Stella. You can't tell, but that Frappe has a whole lot of sparkle to it! I covered it with Wink of Stella to make it look extra cosmic-y. 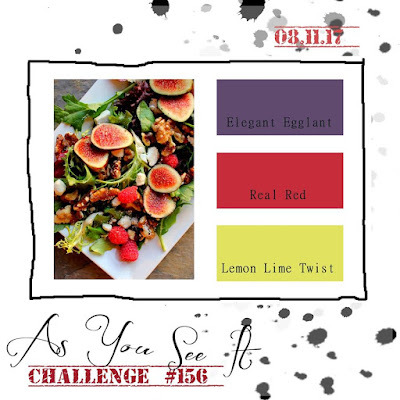 I hope you enjoy my entry for As You See It Challenge #156! 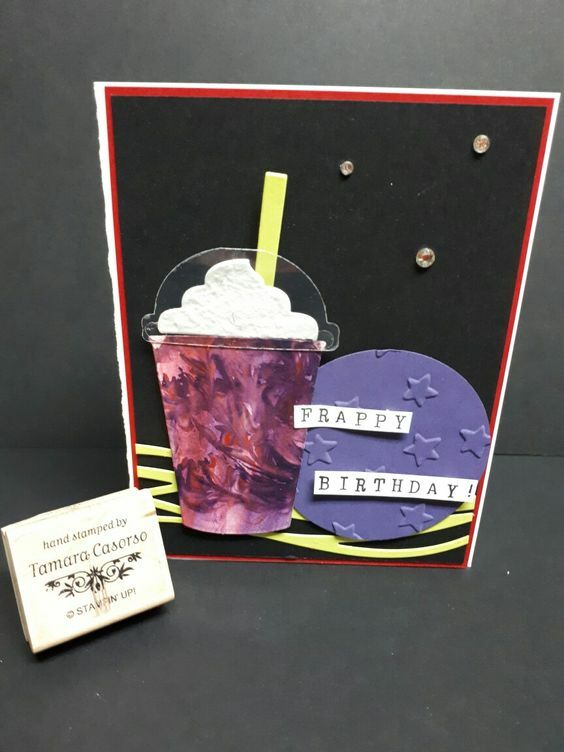 Labels: As You See It Challenge, AYSI Challenge, Basic Rhinestones, Birthday, cards, Elegant Eggplant, Lemon Lime Twist, papercrafting, Real Red, Stampin' Up! Cosmic coffee - great idea! Frappes were always a better idea than a reality anyway! Love the shaving-creamy-fabulousity of your coffee cup. It actually looks 3D! Thanks for getting back to creating after your escape and joining us at As You See It Challenge. So great to have you back again and to see your blog up and running! I love that cosmic frappe - it looks so real and delicious! I like the way you used the Sunshine Thinlits in the background! Thanks for playing along with us at As You See It Challenge! What a cool technique for your "frappe"! Looks delicious and we're so glad you chose our colors this week to create it!